Deepawali the festival of lights, a spiritual light of good over evil stories is still one of the most celebrated festival in the Indian calendar. 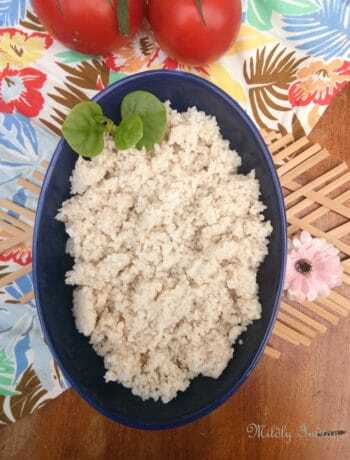 The preparation for this begins more than a week before with sweets and savories prepared in bulk. It is an absolute time for abundance… well, may be, abundance of mouth watering dishes. Most of the Diwali goodies are exchanges adding to the variety. Along with that happens innumerable recipe exchanges over the compound wall.. which is set for trial the very next season. Most of these were the recipe were the measurements were handfuls or katori fuls and was weaned to perfection by the experienced hand. I wanted to relive the experience with my kids, wanted them to experience the joy of making and sharing. So every year we manage to do atleasta couple of trials of new recipes and another few of the well practiced ones. Aided with a few recipes from them, like the Chocolate murmura we send out our boxfuls. 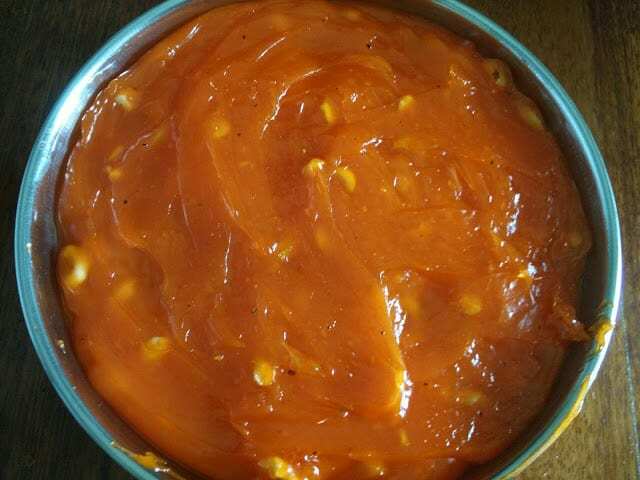 The Bombay Karachi Halwa is one of the most awaited recipe during this time by my family. Well, it is awaited coz I tend to avoid buying white sugar as far as possible. But secretly, I just love this jiggly absolutely junk ( yeah!! I know it fully well)… so we pretty much make it a tradition to make a batch just in time. It’s a very simple recipe with a bit of elbow grease needed. 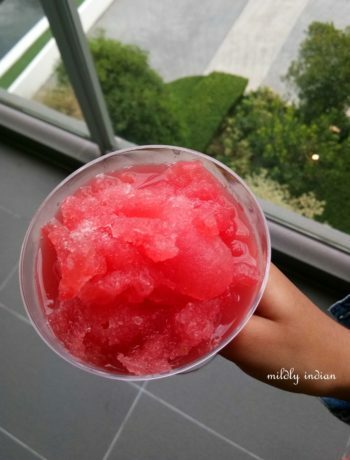 Now mind you the recipe really swells ….so be watchful of the process. 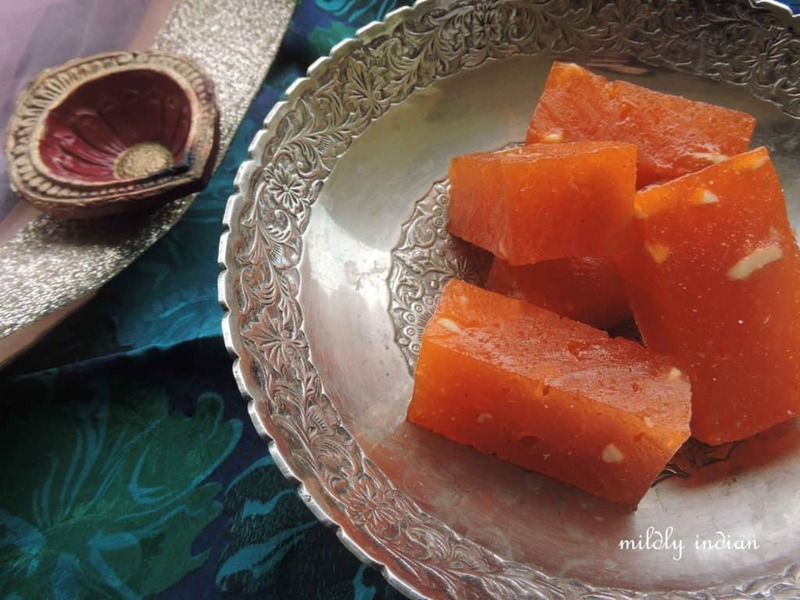 Bombay Karachi Halwa, as you would have noticed in the peculiarity of the name, signifies the route of passage of the recipe. This chewy dessert treat was introduced to the busy Mumbai port and market by the Sindhi merchants. The colourful piece of this “rubber halwa,”quickly caught the market and was sold as pieces wrapped in translucent wax paper. its often presented at the Indian sweet shop in rainbow hues, instantly catching the attention of the child in most of us. I did post it up on my old blog, now, it is time for a revamp. Just to jog the memory…this was the old picture. And if you are having a party for Diwali and looking for some great ideas to entertain, leave a note in the comments and let me help you plan it up… Happy festive season. The joy of exchange for the festival season. 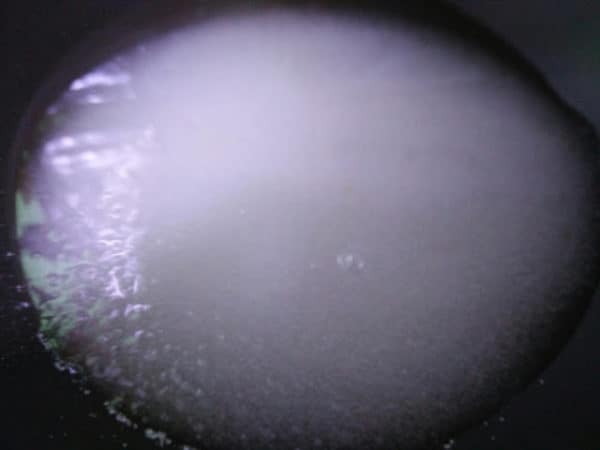 Into a deep kadai, add sugar and one cup of water and bring it to a boil over medium heat to create a sugar syrup. Add broken cashews to the boiling sugar solution and stir till all the sugar dissolves. 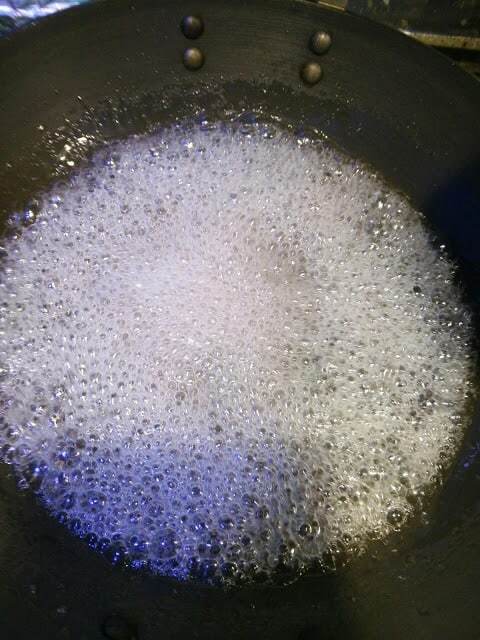 Meanwhile, in a separate bowl,mix the corn flour with one cup of water and a few drops of food colour. whisk this into a lump free smooth slurry. Lower the heat and stream in corn flour mixture a little at a time. Mix continuously at this stage. 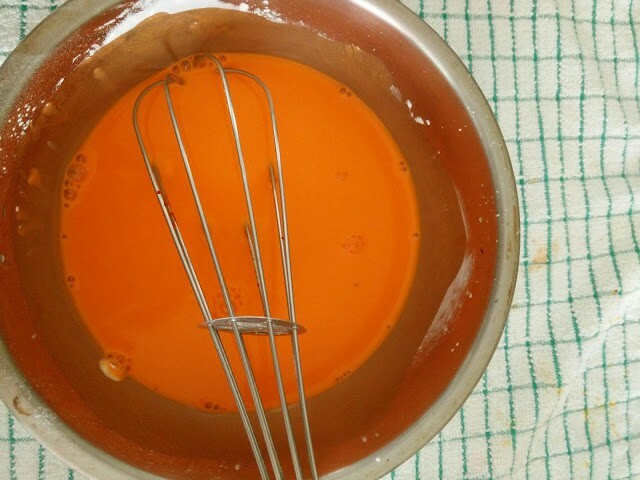 Add in the entire amount of the mixed slurry and still keep up with the gently mixing and folding. Soon you will notice the edges bubble up and turn transparent. Fold them in and keep going with the stirring. the mixture will thicken and become a bit jelly like. now it gets harder with the stirring. but keep at it,till all the corn flour turns jelly like. Add in the ghee and the cardamom powder and stirring in it again... the is process will approximately take 20minutes. Once it all looks glassy, pour into a greased plate. Sooth the top using a greased cake knife or a banana leaf and allow to cool. Using a sharp knife cut into pieces, the shapes you like and serve. I prefer to use a nonstick or a well seasoned cast iron pan to do the process and it is a sticky process. 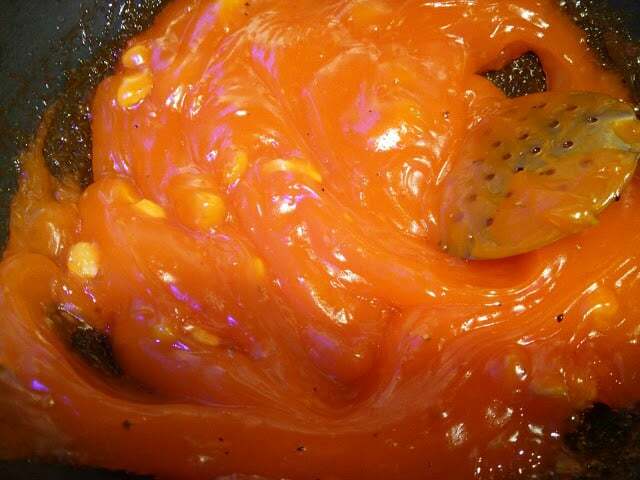 The mixture may bubble up and pop all around so keep the heat in check and protect your arms. Don't stop stirring throughout the cooking process for a smooth lump free halwa. Thanks Poonam.. will encourage you to try. it is quite easy. Wow what a coincidence, I made it just today. Love it. Love such simple and quick recipes . Perfect for festivals. Looks super tempting. Wish I could take a piece. The Bombay-Karachi Halwa has come out so good. I still haven’t given a try as yet. 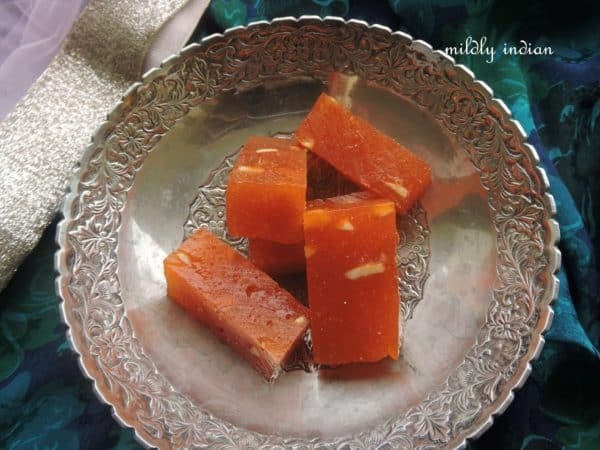 Halwa looks delicious, I never knew this delicacy is so easy to prepare. Good share. 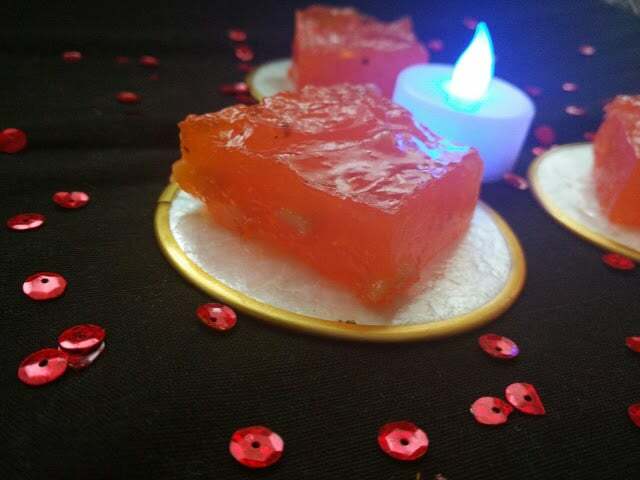 Hard to resist to this luscious halwa, how prefect they looks, omg seriously cant take my eyes off from those slices. Well done. 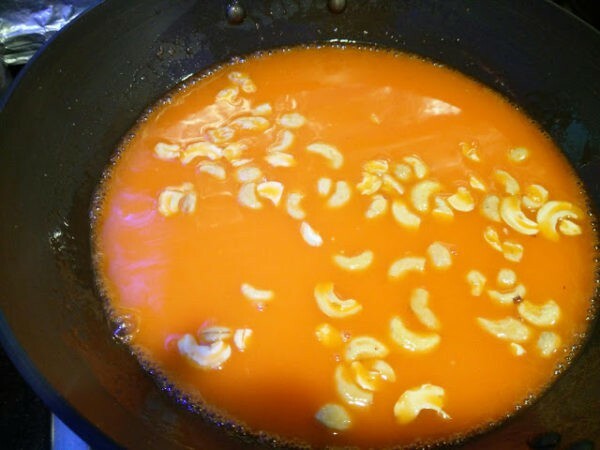 One of the simple and quick halwa recipe. Your Halwa looks so perfect and delicious, I wish I could sneak and grab one piece. This was my favourite sweet as a kid and still can’t resist myself when I see this, you have tempted me now, loved the recipe thanks for sharing. 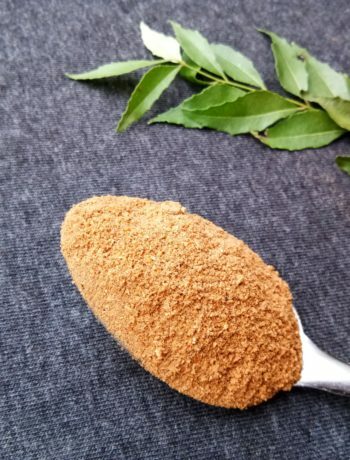 great that you shared with detailed steps, looking delicious, surely a great sweet. If I show this post to my daughter right now, she will demand these She is a huge fan, whenever I make she’d pack 3/4 for herself. You have made these perfectly, loving it. 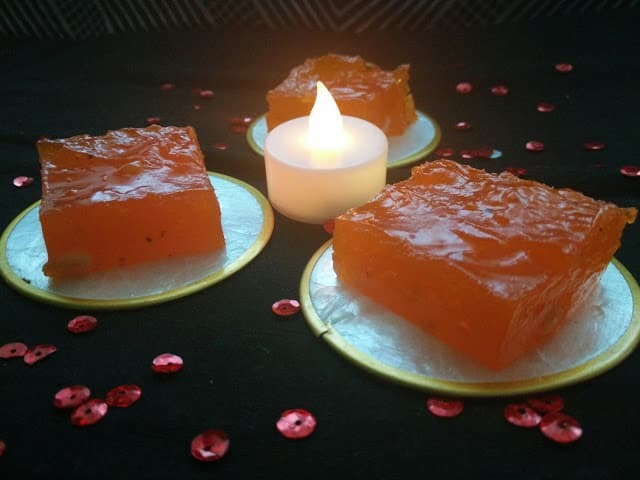 I am a lover of Karachi Halwa.When i was kid and we used get boxes of sweets during festivals.I would always select this karachi halwa and polish it off.There used to be a competition at my place who will get it first.Fantastic share Seema.